Add these branches to your centerpiece designs to create amazing table arrangements and room Decor all in one. 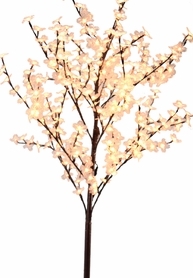 The illuminated branches add height and dramatic glow to your display. 20 Bulbs Warm White LED, 31.5" tall, Bendable Branches, 48 Hours of life per battery set, takes 3 AA batteries (not included). White wire. 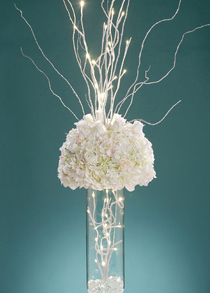 The photo shows the battery operated white branches made into a beautiful display. Flowers and vase are not included.